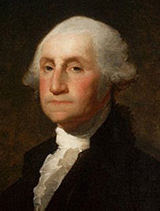 George Washington (22 Februari 1732-14 Desember1799) is the President of the United States (1789-1797) first. At age 11 his father died. George Washington first measure initially worked as a paramedic, he then entered the army at the age of 21 years, and was appointed Lieutenant Colonel when he joined the military service by the Governor of the state of Virginia. Married in 1759 to Martha Dandridge Custis Washington, George Washington took care of the vast plantations in Virginia and a member of the House of Representatives Virginia, until the American Revolution broke out. George Washington was a member of the secret society of Freemasonry. When he was 33, he chose to side with the people of the state of Virginia who rebelled against the British who issued laws - laws that are unjust according perdapat people of Virginia. He was in charge of leading the Virginia troops. In 1775 he was appointed Commander in Chief of the Continental Congress, the 13th Congress of the British Empire colonies. In 1776 American Independence Revolution broke out and the Continental Congress issued the Declaration of Independence and secession from the British Empire. Leadership George Washington contributed much to the success of the colonies in the American struggle for independence. In 1783 Britain recognized the independence of the United States, George Washington came out of the army. Four years later in 1787 he became Chairman of the Constitutional Convention. In 1789 after the Constitution was passed, he was unanimously chosen to be the first American president. He runs two terms from 1789 to 1797, accompanied by John Adams as vice president. In his farewell speech in 1797, he called on the people of the United States to leave the party feeling and a sense of excessive regionalism. In 1799, George Washington died at the age of 67 years in Mount Vernon, resigned after three years as president. He does not have children, just a foster child. The establishment of the Ministry of Foreign Affairs, Ministry of Finance, Office of the Attorney General, and the war. 24 September Under Law Act established the Federal Supreme Court. Endorsement for the American population census for the first time; 3,929,214 population. Federal Government to handle the Revolutionary War debts to the state. February 25 The establishment of Bank of America for the first time. March 3 Taxes on Whiski (drinks) approved. December 5 Washington and John Adams was re-elected as President and Vice President. 22 April Washington issued a proclamation Neutral, warning that American citizens refrain from helping France or Britain in their war. Barbary states began to attack cargo ship - the ship America. June 5 Neutral Constitution Act is enforced, the ban on American citizens to be part of the foreign warships. Whiski rebellion; protests by farmers will be whiskey tax, was stopped by state troopers of New Jersey, Pennsylvania, Virginia, and Massachusetts. Yazoo Land Fraud Scandal between the legislative Georgia (some governors) with four land companies for the area now known as Alabama and Mississippi. They sell a large amount of land on the inside with incredible prices cheap and unreasonable. George Washington's farewell address warned Americans not intervened America will be foreign opposition. John Adams and Thomas Jefferson was elected President and Vice President.